Turn the key on one of these brilliant V6 four strokes, and watch your mate's jaw drop. That unexpected quiet purr is something to behold. 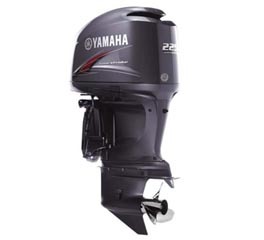 The Yamaha F225C has built a legendary reputation amongst fishermen and commercial operators for its excellent economy and unrivaled reliability. These engines have been designed from the ground up for the salt water environment with blistering speed and miserly fuel consumption. A double overhead cam design with four valves per cylinder increases the intake and exhaust efficiency for clean and powerful combustion. This configuration is matched with electronic fuel injection for excellent fuel economy throughout the RPM range. Your new Yamaha EFI engine is the ultimate in reliability and technological innovation.